To facilitate growth of freight transport in the coming decades, the White Paper of the European Commission indicates that 30% of road freight over 300 km long should shift to other modes of transport, such as rail and Inland Waterway Transport. To achieve the necessary modal shift from road to rail, the rail sector faces an unprecedented challenge of providing the capacity for affordable and attractive services required to enable this modal shift. Improvements are required on five main aspects that are important to shippers: reliability, visibility, flexibility, costs and lead time. This is summarized in the following figure. An alignment of the business models of the different stakeholders within the rail sector. A mental shift of stakeholders towards a more customer- and collaboration-oriented approach. Improved data availability from different public and private sources. Solutions developed on these three topics will be implemented and tested in three Continuous Improvement Tracks. These Continuous Improvement Tracks focus on different aspects of the SMART-RAIL solutions and furthermore aim to make improvements on different corridors. Continuous Improvement Track 1: Wagonload train services. This CIT aims to create and validate a concept for wagon-load trains on two corridors that has proven to be most effective with the support of the stakeholders involved. The corridor Lyon-Munich is targeted with a continuation to Austria, Czech Republic, Slovakia and Hungary. Continuous Improvement Track 2: Managing connectivity of rail with other modes; Control tower for long distance rail freight transport. This CIT aims to increase the reliability for both planned and unplanned disruptions and to increase the visibility of the supply chain. 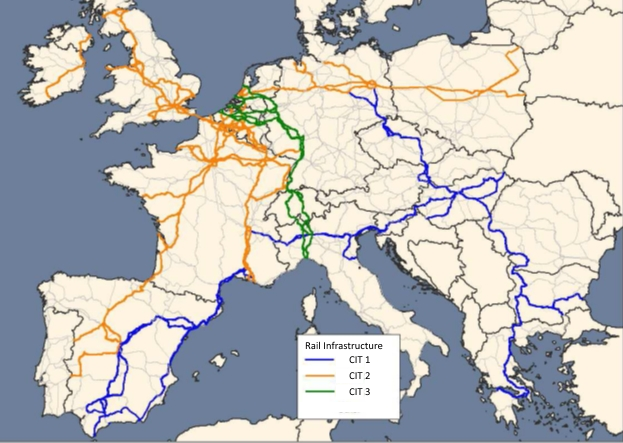 Two long distance intermodal rail connections are covered, namely UK to Poland and UK to France, Spain and Italy. Continuous Improvement Track 3: Reliability in case of (unexpected) obstructions on the track. This CIT aims to increase the flexibility and reliability of rail freight transport within a multimodal transport system. Solutions will be tested on the Rotterdam-Genoa corridor.